This imaginative and beautiful tour to Bali is designed to show you the “real” Bali. Bypass the glitzy hotels and noisy clubs and head for lush landscapes and chilled out resorts. If anywhere embodies my notion of a tropical paradise, it is surely Bali: a gorgeous island, welcoming people, interesting culture, beaches washed by the Indian Ocean, endless sunshine. Ubud is the centre for fine arts, dance and music. Our hotel here is the beautiful Lokha Ubud hotel located in the traditional Balinese village of Keliki on the outskirts of cultural Ubud, where the tropical landscape descends down to the banks of the Wos River and overlooks the scenic ridge known as Bukit Cinta. 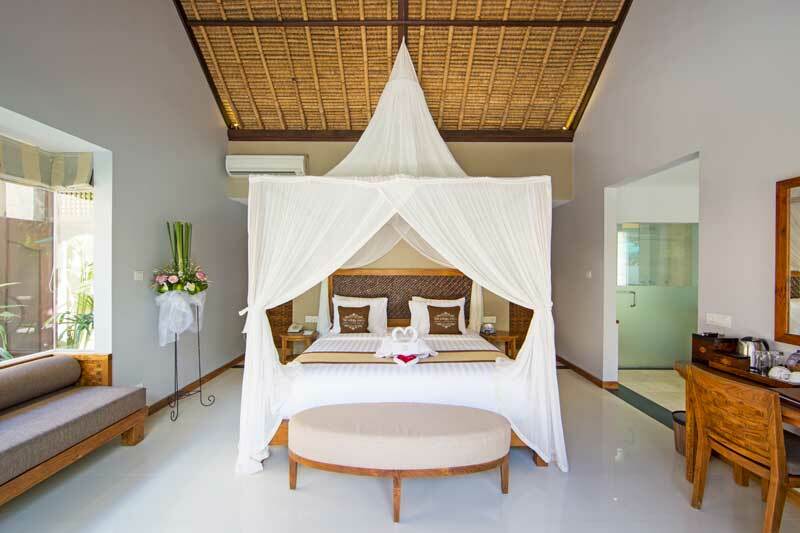 Accommodation at Lokha Ubud on a bed and breakfast basis. After an early breakfast, we take a drive that will include a visit to the holy spring at Tampaksiring water temple. This is a birth place of many legends and ancient miracles. We then head onto Kintamani, where we can see the active volcano of Batur and Batur Lake before returning to the local markets at Ubud. Retail therapy at its best! After an early start, we drive to visit Kerta Gosha the old court for the Balinese. Kerta Gosha is the ancient house of justice located in the centre of Klungkung city which is also known as the floating pavilion. We will visit the Mother Temple Besakih, located on the western slopes of Mount Agung, and referred to as the most important of Hindu Bali, Pura Besakih. We continue to Candidasa arriving in the evening at the Candi Beach Cottage where you can embrace the serenity of peaceful East Bali, with a coconut grove garden that gently rolls on to a beautiful private white sand beach. Accommodation for 2 nights at the Candi Beach Cottage on a bed and breakfast basis. This charming resort is set within a coconut grove garden that gently rolls on to a beautiful private white sand beach The traditional architecture utilizes local materials from Bali and neighboring Indonesian islands, while the turquoise waters of the dreamy, palm fringed swimming pool appear to overflow into the azure sea. Today, we drive to the northern part of Bali, Lovina stopping en route at the village of Sangit to view the amazing Beiji Temple before arriving at our hotel - the Puri Bagus Lovina. Enjoy the infinity pool, dine in the open-air restaurant with spectacular views of the sea and the tropical gardens. Early wake up, to take a boat trip in search of the dolphins along Lovina beach. We head on to Bedugul, stopping en route at Lake Beretan and visiting beautiful Ulun Danu also known as the temple in the lake. Late afternoon, we arrive in the south - at the Nusa Dua Beach and Spa, where we stay for three nights to relax, reflect and enjoy. Today is a free day to enjoy the tranquility of this stunning resort that spreads over 23 acres with an oasis of tropical gardens and sun-drenched shores of beautiful Nusa Dua peninsula. Enjoy the beach or if you would like to try your hand at Balinese cooking, try a course available to exclusively introduce the traditional Balinese cuisine, the course covers hands on cooking, recipe folder, certificate and lunch. Enjoy your last breakfast in the open air and a last swim in clear ocean before your transfer back to Denpasar airport for your onward flight. IMPORTANT: As Professional Travel Organisers, we can tailor any post or pre eclipse travel to suite your individual requirements and budget. Do ask us to design something special for you!